Andrew — Both are very nice images, well seen and crafted. 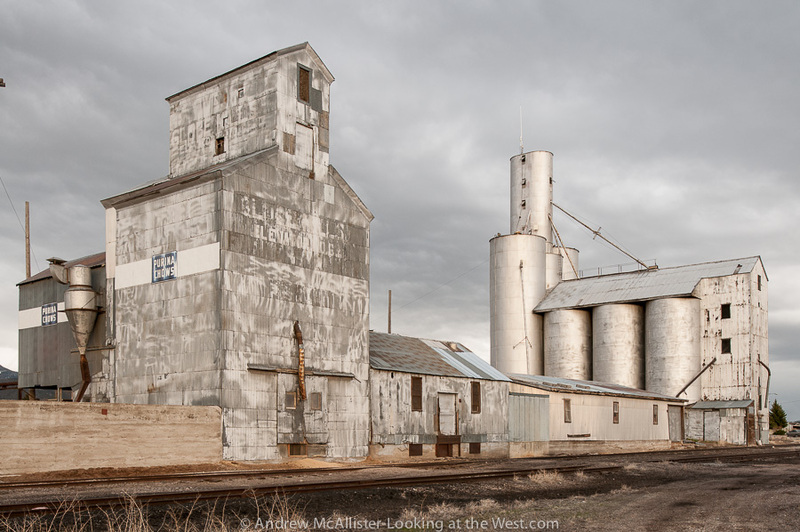 I would probably pick the one with the dark sky for it’s “impact”, greater contrast in the wall and silo details, and the additional shadows in the lower left and lower right. Interesting subject matter! The shot with the dark sky does have a lot of impact. The color and subject matter reminds me of early color photographs by Ansel Adams and Walker Evens when they were on commercial assignments. Thanks for being the first commenter. I’ll probably be in the minority, but I like the first photo with the light grey sky. It reminds me of a watercolor with a pale washed background. The detail in the building is delicate but seems to stand out more. It’s moody, but it’s more pensive than the second photo, which appears foreboding. 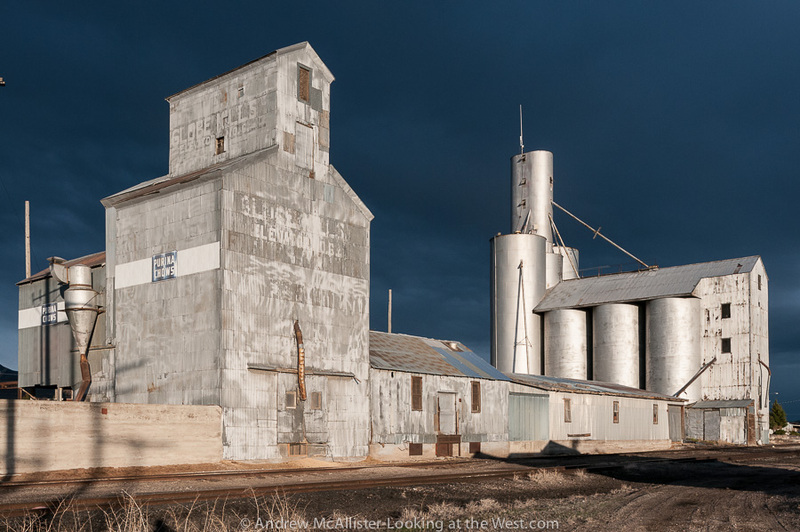 I also admit, I lived in the Midwest for many years and saw a number of photos like the second one: a grain elevator against a darkening or pre-storm sky. It’s why the first one stands out to me, I think. Beautiful photographs, either way. Thanks for your comment. I agree that the second one seems like I have seen it before, many times. The top photograph without a doubt. The muted palette fits the silence of the scene. The tonal range of the silver sky lets the buildings emerge on their own axis creating depth, where the dark sky compresses the space to two dimensions. Thanks for your reply. Good insight I had not considered the compression the dark sky creates. Ryan, I got this comment when I was traveling and did not realize it was you. PM me I might have a trip to Iceland this year. Setting like this do make great backdrops for portraiture. Thanks for commenting. This summer we return to Idaho to the headwaters of the family, the Wood River. We go to scatter the ashes of the youngest of my fathers siblings into that river, and recall his skills with the pen and ardent patriotism that called him to enlist and fight in Vietnam, rather than accept a scholarship to college. I like the one with the dark background better but they are both really cool. This is one of my favorite destinations. I love both images, but prefer the natural light of the first. It is very truthful and shows every bit of weather and age. Your photo os so crisp and clear–just perfect.